South Korea’s Defence Ministry has reportedly warned soldiers against trading cryptocurrencies. The military may view cryptocurrency trading as a form of gambling as crypto exchanges have gone largely unregulated in South Korea. Earlier this month, South Korea’s government proposed banning all cryptocurrency trading. The move set bitcoin prices plummeting and caused mass panic. South Korea’s Defence Ministry is taking steps to prevent its soldiers from getting caught up in the cryptocurrency mania. The Ministry has reportedly warned its soldiers against entering into cryptocurrency trading, according to Korean daily Chosun Ilbo. 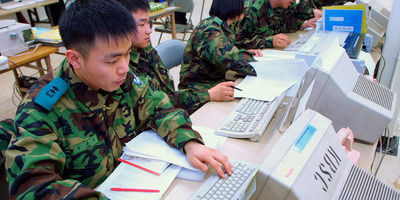 According to Chosun, the ministry said on January 16: “Trading of cyber money online interferes with soldiers’ performance and keeps them from being fully prepared for combat.” The military has reportedly started using pop-up warnings on military computer screens which say cryptocurrency websites would soon be blocked. According to Chosun, the military may view cryptocurrency trading as a form of gambling, on the grounds that crypto exchanges are largely unregulated in South Korea. The country has been tightening restrictions around cryptocurrency trading, as South Korea houses some of the world’s largest cryptocurrency exchanges. It is also the third-largest digital currency market in the world. Given the proliferation of cryptocurrency trading in the country, South Koreans took the news particularly hard. South Korea assured its concerned citizens on Wednesday it would not ban all cryptocurrencies. Instead, the country tightened regulations around crypto trading and banned anonymous crypto transactions. Bitcoin briefly dropped below $US9,000 on Thursday before rebounding slightly.